If you listen to all of the major cloudy infrastructure players - and some of the minor ones too - they all sound like they have all the answers and you need only come to them to solve all your fluffy IT problems. But no one actually has a complete cloudy stack. Even Red Hat, which tried again today to give that impression while at the same time espousing its openness as it fleshed out some of the details of its Cloud Foundations stack. In June, at the Red Hat Summit, the Linux juggernaut and virtualization and middleware player announced a bundling and marketing name for its cloudy infrastructure wares, known as Cloud Foundations Edition One, and today, the company fleshed out how this foundation of products would move companies from creating simple infrastructure clouds that serve up virtual server slices to platform clouds that deliver application and data services abstracted one level up from the virtual infrastructure. Red Hat also announced that it has submitted its set of cloudy infrastructure management APIs, known as Deltacloud, to the Distributed Management Task Force (DMTF), a step toward making the Deltacloud APIs a standard and perhaps something that will allow for the interoperability among disparate and incompatible public and private clouds. Just about everything that Red Hat sells is in the Cloud Foundation stack. This stack includes Red Hat Enterprise Linux as a base operating system for applications. The tosses in Enterprise MRG to manage, meter and control virtual servers and storage, Red Hat Network Satellite to configure, provision and deploy virtual servers and their applications on private and public clouds using Red Hat's KVM, Microsoft's Hyper-V, and VMware's ESX Server if need be. Other operating systems can be deployed on these virtual server slices, of course. The JBoss Operations Network manages and monitors applications running atop private or public clouds on JBoss, WebSphere, or .NET application servers. 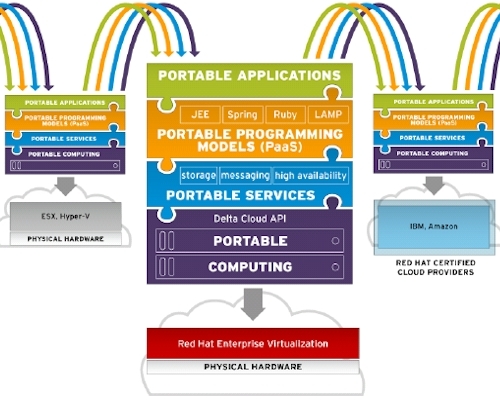 The new word of choice for Red Hat is portability, as you can see, and the mantra at Red Hat is for all applications to be able to work on any cloud, regardless of whether it is public, private, or hybrid, and independently of hypervisor, operating system, middleware stack, and programming language. This is a lofty goal, which is what you expect from cloudy infrastructure I suppose. And it is what chief information officers and business managers want, explained Paul Cormier, president of products and technology at Red Hat. "They want to be able to move their applications, on demand, with an SLA." That's easy to say, but very hard to do, with virtualization for servers, storage, and networking more balkanized than Eastern Europe. But Red Hat, as the open source alternative to Microsoft and VMware, has to play the open card, playing neutral Switzerland, pitching interoperability, portability, and standards. Whether these standards actually get adopted or not is almost immaterial, so long as Red Hat gets credit for trying, allows other products to plug in and play all friendly like, and its own code works the best. The portable computing part of the Cloud Foundations stack is based on the Cloud Engine, which is the Enterprise MRG grid and messaging middleware equipped with a forthcoming hypervisor, due with Red Hat Enterprise Linux 6, that Cormier says will have features to control the quality of service levels of VMs through allocation of CPU, memory, network, and disk. This Cloud Engine includes an administrator portal for controlling users, groups, and permissions; storage management software; billing and accounting modules; resource management tools; and a job scheduler. It is wrapped lovingly in the Deltacloud APIs so other tools can plug into the Cloud Engine and so it can reach out to other tools and parts of a cloudy stack.